I will type up and share my crustless quiche recipe soon. I’ve come across so many that include bread or cracker crumbs in the egg mixture. The point of it being crustless is that it doesn’t have any bread in it. The beauty of the quiche recipe is that it’s wonderfully flexible. The base is the same, but you can play with a variety of filling ingredients. The photo above shows my experiment with sweet potato noodles, made with the 3mm blade of the veggie spiralizer. 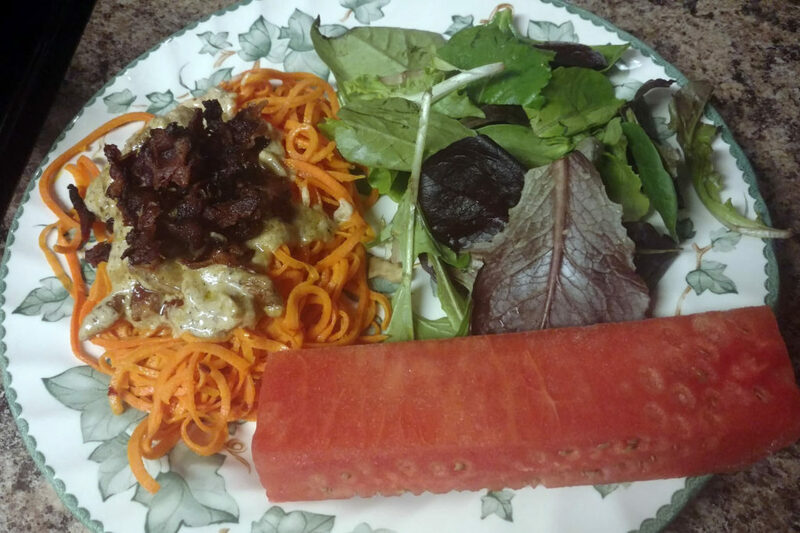 We served the pasta with the bacon cream sauce on top, a side salad, and a wedge of watermelon. The cream sauce is rich and savory; truly delicious.